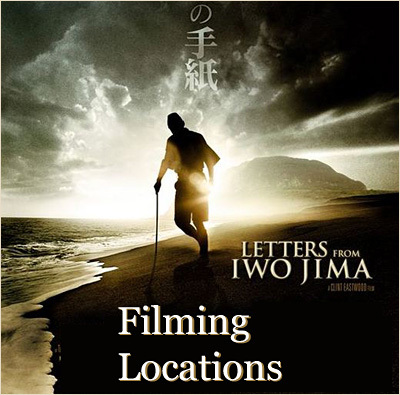 Actual Southern California locations where 2007's "Letters From Iwo Jima" was filmed. two views of the same World War 2 battle in the Pacific, as seen from both sides. who were faced with the impossible task of defending the rocky island. almost all of "Iwo Jima" was filmed here in Southern California. For instance, there was the problem of the black sand beaches of Iwo Jima. ocean in the film. But the actual filming location was nowhere near Japan. Those beach shots were actually filmed on Leo Carrillo State Beach, in Malibu. and in television shows, such as "The O.C." something you won't find naturally on any beach in Malibu. (to preserve the natural environment) and - voila! - instant "black sand" beach! in Malibu (28 miles northwest of Santa Monica). the scenes where you couldn't see the ocean: at a volcano. A California volcano. in the Mojave Desert (30 miles east/southeast of Barstow, CA), south of I-40. deep with black volcanic soil/cinder that resembles rough sand (on camera). shots where they needed us to see the ocean in the background. the soldiers were hunkered down during the bombardment? the original Calico Ghost Town in Barstow, CA. and caves, dug by Old West miners in search of precious ore.
(along with a few later shots filmed on sets built at Warner Bros. studio). You'll find Calico Ghost Town at 36600 Ghost Town Road, in Yermo, CA. supposed to be the "Fort Bliss Country Club" in Texas. off Griffith Park Drive, in L.A.'s own Griffith Park. The photos on this page are stills from the DVD of "Letters From Iwo Jima"
(which you can buy by clicking here) and are copyright DreamWorks SKG.